This ministry brings encouragement and healing to people through prayer. Prayer ministry teams are trained and available to privately meet with individuals who are seeking help from others in bringing their needs to the Lord. If you have a prayer need including spiritual, emotional, or physical healing, or would like prophetic ministry for personal prophecy or dream interpretation, we invite you to contact us to schedule an appointment. "The Lord spoke through the team and they shared specific words that were deeply sentimental to me. I experienced emotional healing as I realized that i was carrying things that had no relevance to what God wanted for me. I immediately left feeling like a huge burden had been lifted off my shoulders. I am very thankful for this ministry." "I went in with an open mind ready to recieve anything the Lord put in front of me. The team did a great job of walking me through what I needed to pray and I experienced a new level of spiritual healing. The night after my Divine Appointment, the Lord gave me a dream to confirm that He has made me whole again. Since my DA my attitude has been more fun, outgoing, and positive." "It was because of your words, prayers, and boldness to speak the Lord's freedom over my life that I am a free man today! I can't even begin to tell you the difference I feel inside my mind, body, and spirt. I could tell a difference as soon as I walked out of my appointment. Thank you from the bottom of my heart for making yourselves availableto minister. You have made a difference in my life." Appointment requests are for "in-person" ministry sessions only (we do not offer ministry sessions over the phone or email). Spiritual, emotional, and physical healing are received like everything else in the kingdom, by faith. But sometimes there are hindrances to us experiencing healing. Unforgiveness, past sins, and family history are just a few examples. 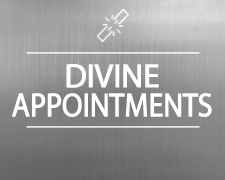 Divine Appointment teams are trained to hear from the Lord about these and other obstacles to healing and help lead you in prayer to address them. The New Testament instruction for personal prophecy is to build up one another with encouragement and exhortation (1 Cor. 14:3). Team members ask the Lord for encouraging words and then share scriptures, impressions, and promises as the Holy Spirit reveals them. It is the responsibility of the seeker to test all personal prophecy to ensure it aligns with Scripture and is confirmed by the Lord. A volunteer team of 3-4 people who are regularly trained in this ministry will meet to pray with you at the time of your appointment. Teams are generally mixed-gender but same-gender teams can be accommodated for certain prayer needs.